Professional photography is an investment that lasts a lifetime. To ensure your work stands the test of time, we use only the very best in printing techniques and the finest products so that you and your family can enjoy your images for many years to come. Our prints are created using traditional light sensitive paper and chemicals guaranteeing that your printed images will last for many generations to come. Our metallic prints are extra special and have a wonderful quality that seems to glow and give you the illusion of a backlit image. We know you will enjoy the images you create with us for the rest of your life and that is extremely satisfying! These sessions include up to an hour and a half of studio time. We will explore approximately five creative ideas. These could be a collection of portraits on white natural light, dark natural light, using the studio props, with siblings, together as a family. Either in the studio or out on location. We will discuss what you want from your session and tailor the time to suit you. You will enjoy an hour long cinematic viewing session to view around sixty portraits to choose from. One luxury 10″x8″ metallic print and complementary membership to Portrait Club is included. 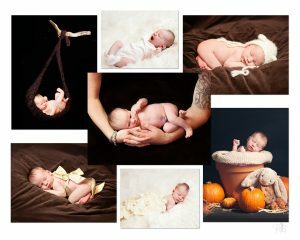 To achieve sleepy curled up newborn portraits, a newborn photography session should ideally take place within baby’s first fourteen days. We realise this isn’t always possible though and class newborn as up to one month of age. 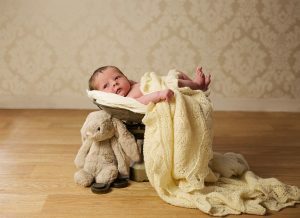 We recommend that you allow up to three hours for your newborn photography session (though we rarely need this long). Session includes use of all our gorgeous throws, wraps, props and head bands which will all be washed and cleaned after your session. Approximately five creative ideas (these could be curled up on whites, curled up in furs, being kissed on dark throws, nestling your baby in a box, basket or bucket, surrounding them by cuddly toys, or curling them up in your arms – we will talk over exactly what you want from your newborn photography session before we begin). You will enjoy an hour long cinematic viewing session about a week after your photo shoot, where you will view around sixty portraits to choose from. One luxury 10″x8″ metallic print and complementary membership to Portrait Club is included. 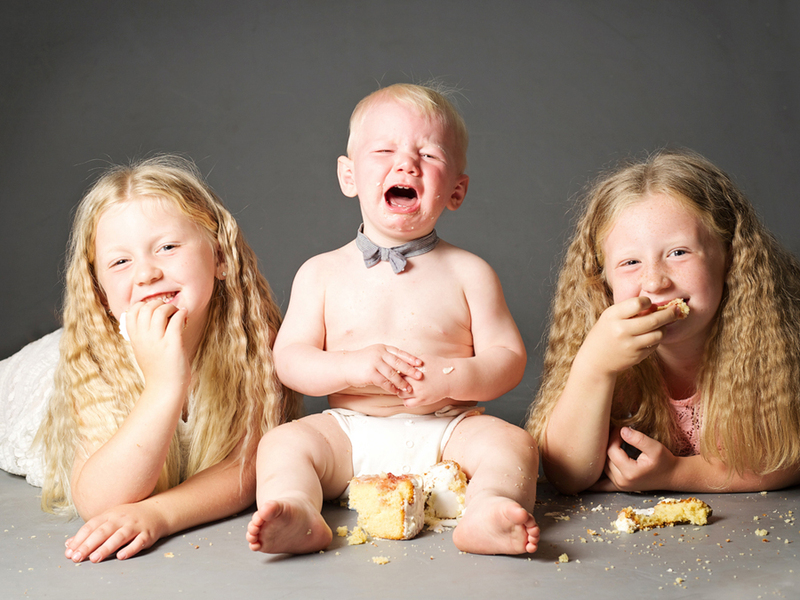 A cake smash photography session really is a wonderful way to celebrate your baby’s first birthday. Your session includes up to an hour and a half of studio time, a delicious and beautiful handmade cake (most of which you will get to take home) and approximately five creative ideas (we’ll start with a gorgeous tea party set up, followed by a series of natural portraits and playing with the props you have brought. Then we’ll start to get messy, perhaps with a bit of baking, or strawberries and cream, and to finish we’ll have the cake smash!). After your session, you will be invited back for an hour long cinematic viewing about a week later, where you will view around sixty portraits to make your choices from. One luxury 10″x8″ metallic print and complementary membership to Portrait Club is included. Just want a short shoot to top up your family portraits or capture the magic or your pregnancy. Our mini sessions are just 30 minutes and include an exploration of two creative ideas, twenty portraits to choose from and one luxury 6″x4″ metallic print. Come for four sessions and document the amazing Milestones in your little ones first months. For Bump and Beyond start with maternity, then newborn, six month and first birthday. Or for Milestones start with newborn, then six month, first birthday and eighteen months. Sessions can be in studio or on location and each includes and luxury 8″ metallic print and complementary portrait club. If an annual collection is purchased, this session fee is refunded. For your membership fee, you will receive a second portrait session with a luxury 10” print. If you purchase a print package you will receive complementary digitals that practically double the package size and value to you. If you are purchasing digitals, membership will increase the print capacity of your digitals from 8” to a whopping 30”. And of course we have our monthly contest that as a member we will invite you to enter giving you a chance to win one of our gorgeous big prints. For additional work choose between our Classic Collections or if want to record your child’s Milestones with us, choose an Annual Package and receive three additional complementary portrait sessions. Fill in the form and we’ll be in touch to answer all your questions.